Occasionally, life imitates art, even in the cinema. “As Above, So Below” director John Erick Dowdle’s “No Escape,” (*** OUT OF ****) qualifies as a spellbinding, ‘stranger-in-a-strange land’ saga about an amiable American family scrambling to stay alive during a cataclysmic coup in a nameless Southeast Asia nation. Initially, when Dowdle took his cast and crew to Thailand back in 2013 to lens this gritty, straightforward, action-thriller, few knew the smoldering political unrest would flare up into a full-scale military insurrection later in 2014. Moreover, the recent August 2015 bombing at a popular Hindu shrine that left 20 people dead and more than 100 wounded has heightened the plausibility of Dowdle’s nail-biting, take-no-prisoners thriller. Originally, this Weinstein Company release was entitled “The Coup,” but audiences couldn’t relate to such as bland title so the producers changed it to something appropriately melodramatic. Reportedly, when Dowdle made “No Escape,” he went to painstaking lengths not to specify Thailand as the film’s setting. Additionally, the filmmakers refrained from using the color yellow in their palate because it represents Thailand’s official color and its royalty. This white-knuckled but xenophobic exercise in suspense dispenses with comic relief, clever one-liners, and amounts to a cautionary tale for tourists contemplating a vacation in Thailand. Indeed, China, Australia, and Hong Kong officials have issued travel warnings to tourists about Thailand. In Dowdle’s R-rated epic, murderous mobs armed with sticks, stones, machetes, knives, revolvers, and assault rifles declare an ‘open season’ on tourists and those who accommodate these foreigners. 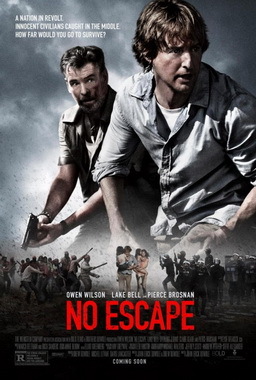 Ostensibly, “No Escape” has been lambasted by many film critics because it depicts the rebel natives in a demonic light but portrays tourists, particularly Americans, as if they were saints. “Empire” magazine critic Simon Crook has even gone so far as to compare “No Escape” to a zombie movie and Americans as the endangered species! Austin, Texas, engineer Jack Dwyer (Owen Wilson of “Behind Enemy Lines”) represents a benevolent American company dispatched to an unknown Asian country to improve the quality of the water supply. Events beyond Jack’s control have forced him to take this dreadful job as a last resort because his other enterprises haven’t worked out for him. Predictably, Jack refuses to fly off to this exotic, faraway, fourth-world, paradise with packing along his family, wife Annie (Lake Bell of “Pride and Glory”), and their two daughters. Imagine a Brady Bunch with only two children finding themselves swamped in a blood and gore revolution with bloodthirsty natives dying to kill them, and you’ve got the gist of “No Escape.” Dowdle and his brother Drew who helped him script “Quarantine” spend the first ten minutes or so of “No Escape” introducing us to Dwyer and his happy family. Adorable daughters Lucy (Sterling Jerins) and Beeze (Claire Geare) are elementary school aged moppets who are no more prepared than their parents for the perilous predicaments that await them. What the Dwyers don’t know is that the country’s current President has just been terminated with extreme prejudice by ruthless terrorists. You know things are bad when the President’s personal bodyguard takes one look at what has happened and slashes his own throat. Meantime, the Dwyers have checked into the motel, and Jack has gone downstairs to report that nothing seems to work in his room when he spots a fellow passenger from his plane performing karaoke. Hammond (Pierce Brosnan of “GoldenEye”) is a grizzled, alcohol-imbibing Briton who knows the country like the handle of the automatic pistol that he conceals on his person. Hammond and his native grinning pal Kenny (Sahajak Boonthanakit of “Elephant White”), who owns a taxi plastered with posters of country music crooner Kenny Rogers, help the Dwyers commute from the airport to their motel without being taken advantage of by the locals. Jack leaves the motel to buy a USA Today newspaper and finds himself caught between rioters wielding bombs, baseball bats, and guns and the police armed with helmets and shields. Jack knows that his goose is cooked when the rioters scatter the police and start executing Americans as well as any locals who appear to be collaborating with the American devils. The first obstacle the Jack and Annie face is getting out of their motel room without being slaughtered. They join other nervous tourists barricaded atop the motel roof. Initially, an approaching helicopter allays their anxieties. Ironically, the chopper carries rebels equipped with machine guns who aren’t about to rescue anybody. Jack realizes their only alternative is to jump to nearby high-rise building. If you’ve seen the “No Escape” trailer, you’ll be prepared for this ordeal as the Dwyers hurl their horrified kids into the sky toward the other building. These taut moments will grip you with chilling terror, and things escalate for the worse as they flee for freedom. One crucial scene shows the entire family astride on a motorcycle that the father pushes through waves of irate rebels, but only one rebel spots their Nike sneakers. Later, when Jack barters for a boat so they can cross into Vietnam, he has to surrender his Nikes. “No Escape” reminded me of a long dormant film genre that flourished during the Cold War in the 1960s. In a game of political dominoes with the Communists, imperialist Americans sought to convert Southeast Asia countries to capitalism. Specifically, the Marlon Brando diplomatic thriller “The Ugly American” (1963), concerned Uncle Sam’s meddling in local politics where those empire-building antics were not appreciated. Meantime, “No Escape” conjures up a harrowing portrait of heroism under fire. The imperiled American family emerges as whitewashed saints, while virtually all of dark-skinned Asians are hopelessly maniacal miscreants. Mind you, it is difficult not to root for Wilson and his family, especially when former James Bond star Pierce Brosnan sacrifices his life to rescue them from their homicidal Asian adversaries. Although Owen Wilson is best known for his smarmy comedies, he sheds his light-hearted image here. During one scene, when Jack’s own daughter is forced to hold him at gunpoint, director John Erick Dowdle doesn’t let the suspense slacken for a second. This scene is just as intense as the Russian roulette scenes in “The Deer Hunter.” “No Escape” will keep you poised on the edge of your seat, even when you know you’re being shamelessly manipulated for the sake of thrills and chills.